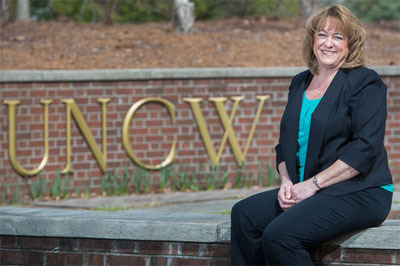 While she loves her role as administrative associate in the Office of the Vice Chancellor of Business Affairs, Gina Bowen finds her work with the Staff Senate the most rewarding. NEW: April 20 Seminar, "The Pedagogy Behind Yellowdig"
Early Deadline: Submit items for the next SWOOP by noon on Thursday, April 13. 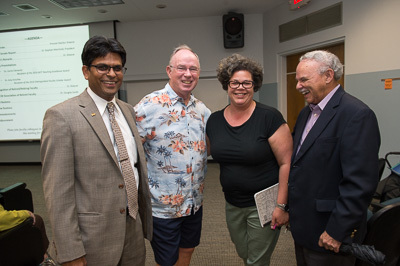 Aswani Volety, dean of the College of Arts and Sciences (far left), and Tiffany Gilbert, chair of the English department, stand with retired professors John Bennett (middle) and Dennis Carter (far right) during the April 6 spring faculty meeting that recognized retirees.